Enter the Cursed Tomb of the Lost Queen! Egyptologists and archaeologists are abuzz about recent discoveries by a university dig team, but suspicious accidents left the group isolated and leaderless. Is a curse burying their progress or is someone sabotaging their success? Find out as you assume the role of Nancy Drew and uncover the lost secrets buried within the Tomb of the Lost Queen! Sleuth with a New Interface! Copyright © 2012 Her Interactive, Inc. 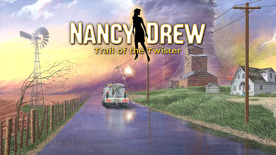 HER INTERACTIVE, the HER INTERACTIVE logo and DARE TO PLAY are trademarks of Her Interactive, Inc. NANCY DREW is a registered trademark of Simon & Schuster, Inc. Licensed by permission of Simon & Schuster, Inc.